Introduction: The previous generation Curado series is probably the single most respected baitcaster under 150 dollars, and rightly so. The reel has stood up to the test of time and become a favorite weapon in the hands of both tournament and weekend anglers. Known for its reliability and ease of use the Curado has undoubtedly been labeled a �legend� among bassmen. So as the time drew near for a redesign we are sure the team at Shimano pondered long and hard about what to do about this prominent reel. After much testing, and even more anticipation from our readers, we at long last bring you a review of the new Curado D.
Line Retrieve per crank (in) 25"
The new Curado comes in a variety of sizes (100 and 200) and the reel�s profile is mostly differentiated by length. The 200 sizes are about the same length as the Chronarch B, while the 100 profile is a near carbon copy of the Chronarch 50Mg. 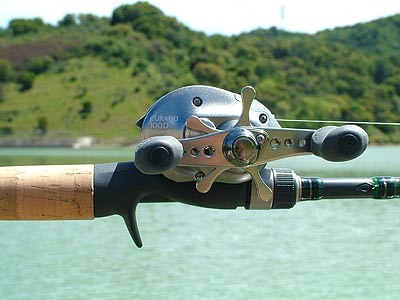 The Curados come in both right and left hand retrieves and also in a number of different gearing ratios. The larger 200 series reels come in either power 5:1 or burner 7:1 ratios. That�s right a Curado with the same speed as the Quantum Burner we just finished testing. The 100 size reels come with the multi-purpose 6.2:1 ratio. 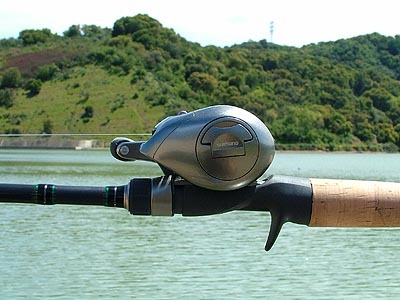 Thus the lineup of Curado reels has been separated out to be application specific. Does that really make sense for a mainstream reel? 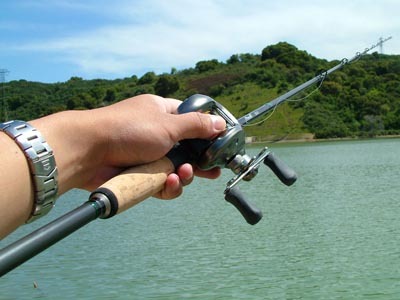 After all, the original Curado was a do �everything� for �everyone� type reel, and priced affordably to match. There lies the catch. The Curado is no longer positioned as a �mainstream� reel�more on that later. 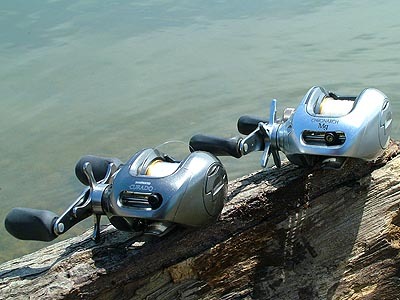 The weight penalty for moving up to the 200 sized reels is 2.4oz over the 100D�s 7.4oz weigh in. The finish of the Curado feels quite high quality, and is a very light green pearl color (actually looks somewhat silver in low light), tying it to the previous generation SF reel. Unlike the smaller CU100B the new Curado is devoid of all the economical black plastic knobs and fittings, and in their place are now all aluminum components. The reel looked and felt familiar all over, partly because of the Scorpion connection, but more so because I currently enjoy fishing the new Chronarch Mg so much. Enough of the �impressions� talk, it is high time to get this bad boy wet. The Field Tests: I was drooling to get the Curado out on the water, in fact I was darn near foaming at the mouth by the time I finally backed the Triton into the water. It doesn�t come often that you have the chance to evaluate the next legend in the making, or so I hoped. We ultimately opted for the standard 100D rather than the 200 sized reels in this round of our tests. 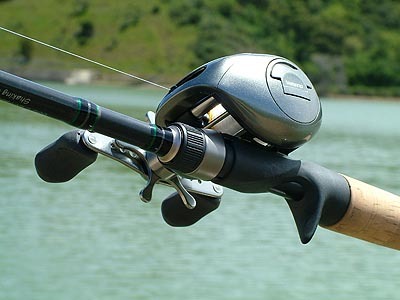 The primary reason is this reel is the most flexible in terms of application, and more akin to the original Curado philosophy as a single workhorse baitcasting reel. For our tests we mounted the reel on a number of rods including Loomis�s, Crucials, Kistlers, and Powells. We used the reel for everything from ripping jerkbaits to fishing heavy drop shot rigs. All of our tests were conducted on the California Delta and local reservoirs over an extended period of nine months. 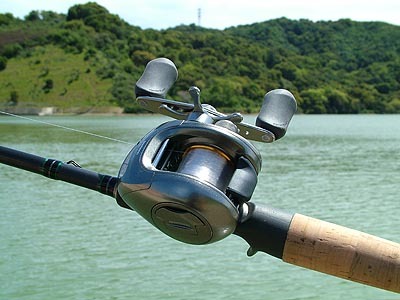 Casting: Spooled up with 10lb Yozuri Hybrid our test reel was finally ready to rock. One of the first things you notice when spooling this reel is the lack of a perforated spool. The Curado features a new spool design that looks solid from the outside, but actually is aggressively ported on the inside for weight reduction. 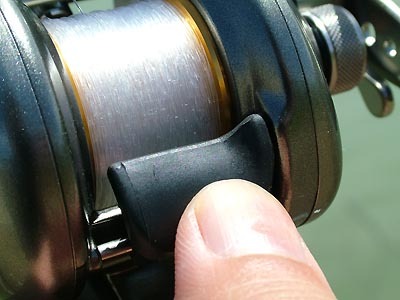 By doing this and using a new spool reinforcement design Shimano hoped to reduce mass of the spool walls enough to reduce overall spool weight and achieve lower startup inertia for more cast accuracy and manageability. The Curado is the first reel to make use of this new �Magnumlite� spool design. The Magnumlite spool works on two levels. Not only does Shimano succeed in making a reel that casts very good distances but the startup is extremely smooth and steady. I knew exactly how far and where lures were going with a flip on the wrist, and when it came time to whale the rig we achieved 90-100 feet with our 1/2oz casting plug without much difficulty. Casting distance is good but casting feel is even better. 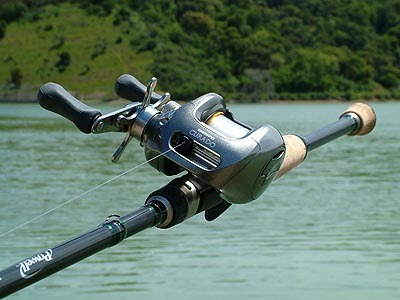 The new Curado is exceptionally well suited for accurate casting, and the larger size reels with higher ratios are serious power fishing solutions. Casting is good, and accuracy is excellent...its all about the Super Free!